On January 2nd, former and current Firebird Boys Lacrosse players and coaches got together for the annual Alumni Lacrosse Game. For the first half of the game, the alumni used the advantage of experience to jump to a quick 9-1 lead over their younger counterparts. In the second half, teams were split evenly between current and former players, and the score stalled at 3-3 late in the 2nd quarter before Coach Elsdon teamed up with alumni Luke Annicharico and Martin Boyd to manufacture the winning goal. 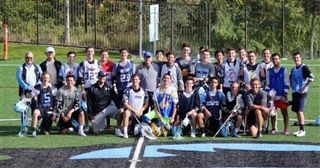 Players, coaches and parents alike relished the opportunity to reunite and catch up during the holiday break.